Having my portfolio up on the Brighton Illustrators’ Group website has really been working for me recently, and I’ve had a couple of jobs from it in the last fortnight. When a new commission comes in, there are lots of things to talk about with the client – scope of the project, the deadline, how they envisage it looking – and then there’s cost. In theory, it ought to be easy for me to set a price: I have a day rate, so I can charge by the hour… but the problem is, of course, at the beginning, you are never quite sure how many hours the job will take. The part that I find hardest to quantify, and the part that is perhaps hardest to justify to a client, happens before you sit down and start on the finished piece. 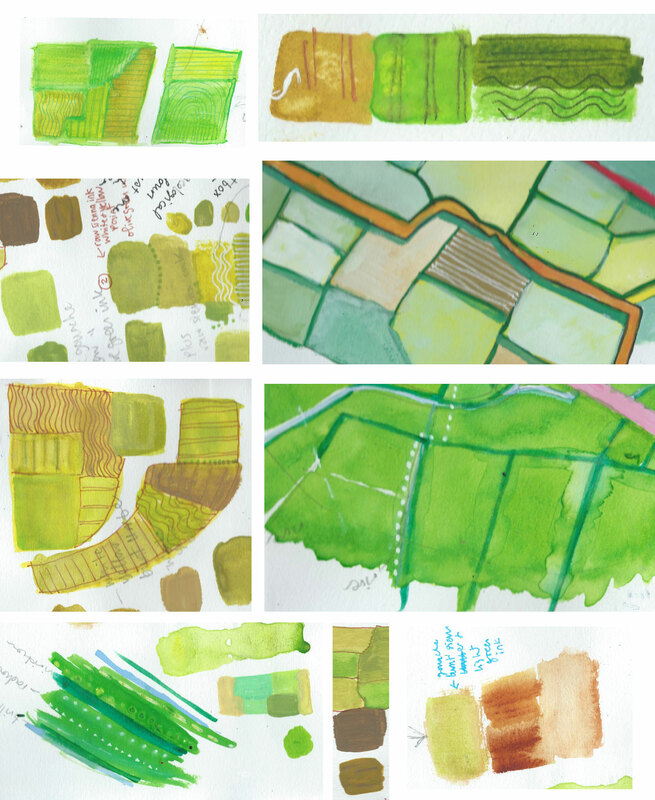 Above, you can see just a few of the many tests I did to find the right colour, medium and style for the work. All together, they added up to many hours. Now, what do you do? Half of me thinks it’s right to include these in the cost. But I also have a nagging voice which says ‘If you were a better illustrator, you wouldn’t need to have this period of experimentation. You’d just sit down and make a start’. In my heart, I know that won’t be true, unless every project you embark on is in the same style. Some illustrators do work very happily in their signature style for an entire career, and I guess that’s where this voice comes from: there’s a part of me that believes that I should be selling my accomplishment, not my experiments. There’s another part of me that thinks experiments are what make a work the best it can be. It has taken me a long time to see this initial period, when you know what you’re striving for, but are not quite sure how you are going to get there, as a natural part of the creative process, and not a reason to panic because things don’t come out as you think they should, the very first time you put your brush to the paper. Here is a small peek at the final style I decided on, after all that colour mixing, medium-swapping and style-hopping. And supressed panicking. I wonder if I’ll ever be able to skip the panic phase all together.That’d be nice.